VATICAN CITY (CNS) — As it did prior to the Second World War, the rise of nationalism in the world poses a threat to peace and constructive dialogue among nations, Pope Francis said. During his annual address to diplomats accredited to the Vatican, the pope said that the establishment of the League of Nations nearly 100 years ago ushered a new era of multilateral diplomacy based on goodwill, readiness among nations to deal fairly and honestly with each other and openness to compromise. 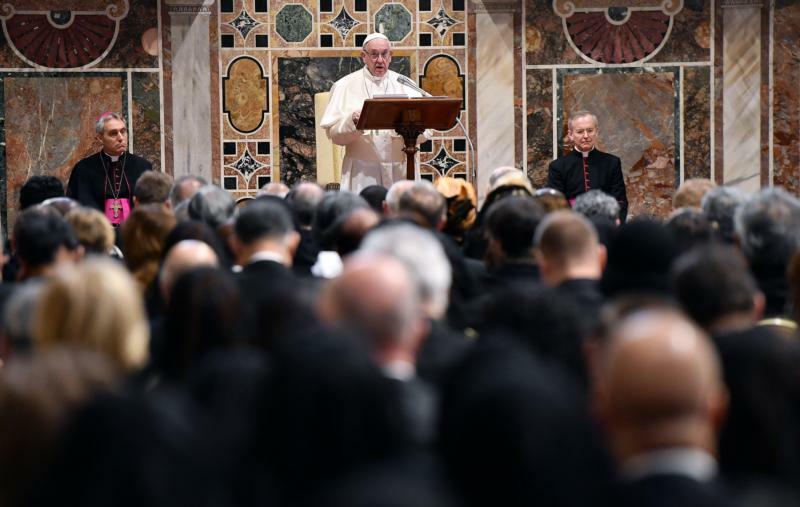 “The League of Nations failed for these very reasons, and one notes with regret that the same attitudes are presently threatening the stability of the major international organizations,” the pope said. “Peace is never a partial good, but one that embraces the entire human race,” he said. Pope Francis also made an appeal for assistance to migrants who are forced to emigrate due to “the scourge of poverty and various forms of violence and persecution,” as well as natural disasters and climate change. Among the most vulnerable in today’s world, the pope continued, are young people who face an “uncertain future” due to lack of employment. Urging world leaders to take steps to ensure the physical, psychological and spiritual growth of children, Pope Francis acknowledged the church’s failure to protect children. Child sexual abuse, especially by members of the clergy, “is one of the plagues of our time,” he said. Pope Francis also urged the diplomatic community to continue to work toward building peace between nations divided by war. While there have been significant strides in building peace in some places, such as the end of the decades-long conflict between Ethiopia and Eritrea and an easing of relations between North and South Korea, the pope called for peace in areas such as Venezuela and the Holy Land which are still affected by internal strife and divisions.